The stunning and isolated island country of New Zealand is so remotely located on the globe it was only settled by Polynesians (who later called themselves Māori) about 700 years ago. It boasts some of the most distinct biodiversity, featuring animals and plants found nowhere else on Earth. The topography is varied, too. From snowy volcano tops and lush forests to rushing rivers and fertile farmland, New Zealand is ripe for adventure, whether off the beaten track or among its charming towns. Planning a trip? This five-day itinerary—filled with wine, fly-fishing, hot springs, and history—will help you make the most of your time on the North Island (Te Ika-a-Māui), hitting up Hawke’s Bay and Lake Taupo. Your best bet is Air New Zealand, which has won countless accolades over the years—most notably in 2017 when they nabbed Top Airline in the World by Condé Nast Traveler readers. They’ve also won Airline of the Year by airlineratings.com for the last four years. They provide plenty of affordable flights out of the U.S.—and best of all, the flight attendants are cheery and attentive. Sit back and enjoy some free-flowing wine and New Zealand delicacies in Premium Economy, which has wide, reclining leather seats. Dare we say it: You’ll actually enjoy the ~14-hour trip to Auckland. Napier is a small coastal town in Hawke’s Bay with a beach-y vibe. Its downtown area has the biggest collection of art deco buildings in the world, comparable to Miami’s South Beach. Book a room at the Art Deco Masonic Hotel. The sprawling hotel has an upscale restaurant on the first floor called the Emporium Eatery & Bar. It’s all dark wood and marble with knick-knacks galore, as well as an art deco frieze under the bar, and lots of black-and-white photos of the town through the last hundred years. It’s right on the main drag across from the bay, surrounded by the National Aquarium of New Zealand; the Marine Parade; and the MTG Hawke’s Bay museum, theatre, and gallery. 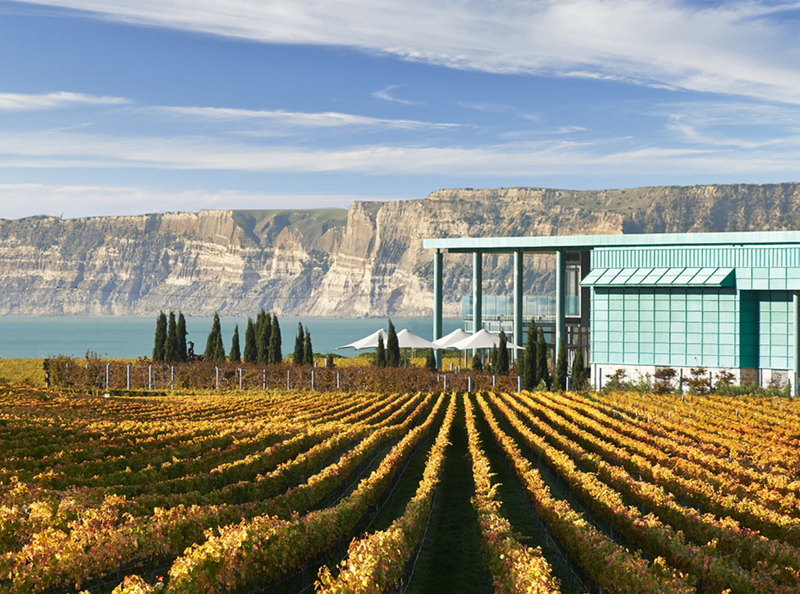 Napier is also located in prime wine country, with some of the oldest vineyards and estates in the country, so a trip outside of town is well worth it. If you’re looking for a less formal respite, you can hit up their Rose Irish Pub around the corner for a bit of local color. Lunch and dinner menus spotlight local produce, seafood, and meat. Walk with the Ancestors Tour: To start off a trip to the North Island, go on the Walk With the Ancestors Tour in Waimarama on the beach, just south of Napier. Here’s where the great migration canoe, called Takitimu, was pulled ashore 800 years ago. 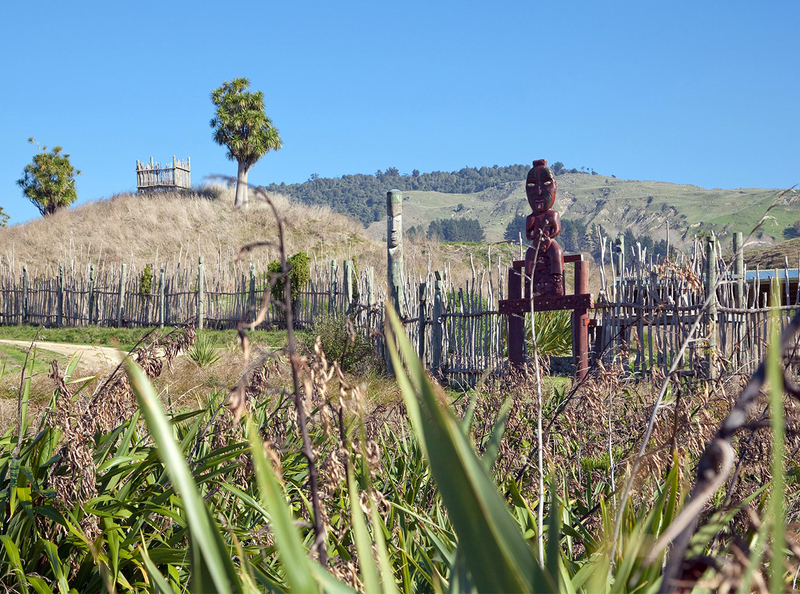 Māori elder Robert MacDonald of the Ngāti Kahungunu tribe and his great-nephew Ike Wallace lead a tour that starts at the beach and retreats up into the hills. Robert and Ike provide tales and insight into the Māori culture and folklore, taking you up into the sacred heart of the old settlement, sharing songs and traditional tea made from kawakawa leaves. A short hike back around the hill brings you to a natural, spring-fed pond filled with sacred longfin eels. Lucky visitors may be asked to plant a kauri tree sapling—sacred to the Māori—which can live to be 1,000 years old and grow up to 160 feet tall. The Conservation Reserve the ancient site is on has also been steadily adding native plants, while removing invasive blackberry bushes. As the Hawke’s Bay region is home to the oldest and most established wineries in New Zealand, a trip to some of the best is a must. If you’ve got the time, try to visit both Craggy Range and Elephant Hill, two of the top wineries in the region. Craggy Range, which was heralded as the New World Winery of the Year in 2014 by Wine Enthusiast magazine, opened in 1993 by a family seeking to create a world-class winery. They found the temperate climate and fertile soils around Hawke’s Bay perfect for growing grapes and selected two sites, one in an ancient river bed ideal for sauvignon blanc and a higher spot with a mix of rock-and-clay soil perfect for pinot noir. 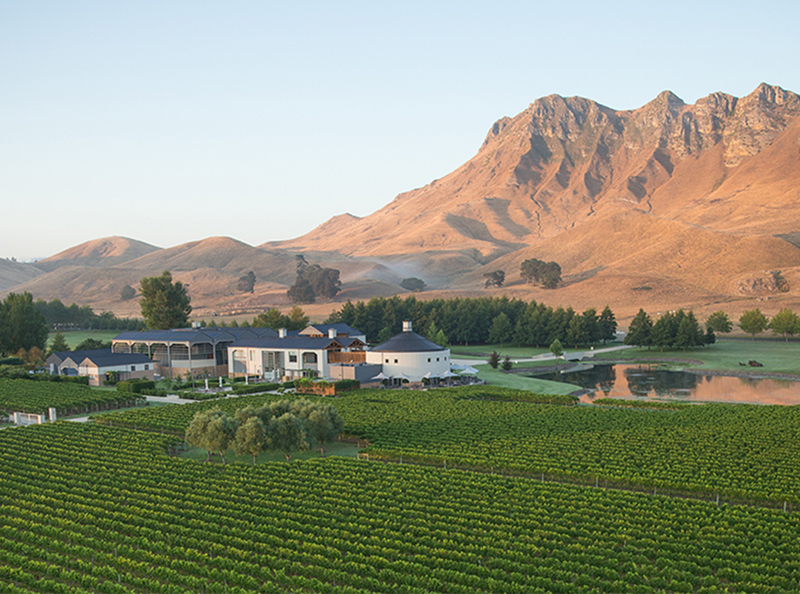 The winery sits below the “craggy range” of Te Mata peak, and has Terrôir Restaurant as their focal point. Nosh on Te Matuku oysters or a plate of cow-and goat-milk cheeses sourced from New Zealand. Pair it with the 2016 Aroha pinot noir, which has a deep ripe fruit aroma and savory oak flavors. Close to the Pacific Ocean on Cape Kidnappers sits Elephant Hill. Founded in 2003, it boasts three vineyards around Hawke’s Bay to provide a range of soils and micro-climates to better enhance each grape variety. Try to visit during the day to get the full impact of the scenery: towering cliffs rise from the water, providing a dramatic backdrop. Start with oysters, then dig into Firstlight waygu beef paired with the 2013 Elephant Hill Reserve Merlot Cabernet; its rich fruit and raspberry notes match well with the marbled steak. Sai Thai Eatery: This chic, modern eatery is one of Naiper’s newest spots, offering a full menu of Thai comfort food. Order a few small plates, like mu ping, grilled pork skewers, and spicy mussels. For a bigger meal, opt for pork spare ribs (so tender and juicy), tamarind salmon, or plaa gong (shrimp and lemongrass). The bar is fully stocked with local wines, like those from Elephant Hill, Stonecroft, and Te Awaga Estate; and local breweries are well-represented on the drink list, with offerings from Hawkes Bay Brewing Company and Garage Project. Hawke’s Bay Farmer’s Market: Renowned as one of the best farmer’s markets on the North Island, the Hawke’s Bay Farmer’s Market is put on every Sunday at the Hawke’s Bay Showgrounds from 8:30 a.m. to 2:30 p.m. It’s a great way to get a real feel for the local produce—and no matter the season you’ll encounter a smorgasbord of delights. If you plan on going on any road trips around the North Island, be sure to pick up some provisions, like a flax and millet baguette from Yeast Coast Baking Co., some venison sausage and beef jerky from the Organic Farm Butchery, and a few hunks of sheep milk cheese from Origin Earth, plus a bottle of Orcona Chilis ’N Peppers Rings Around Uranus habanero hot sauce to take back with you to the States. Stop by the Pizza Guy—who makes wood-fired pies and French waffles in his tiny trailer. This should hold you over for the next leg of your trip in Lake Taupo. Head into the hills toward Lake Taupo, nestled in the caldera of the inactive Taupo Volcano. It’s the second largest freshwater lake in Oceania with depths up to 600 feet and a 120-mile coastline. 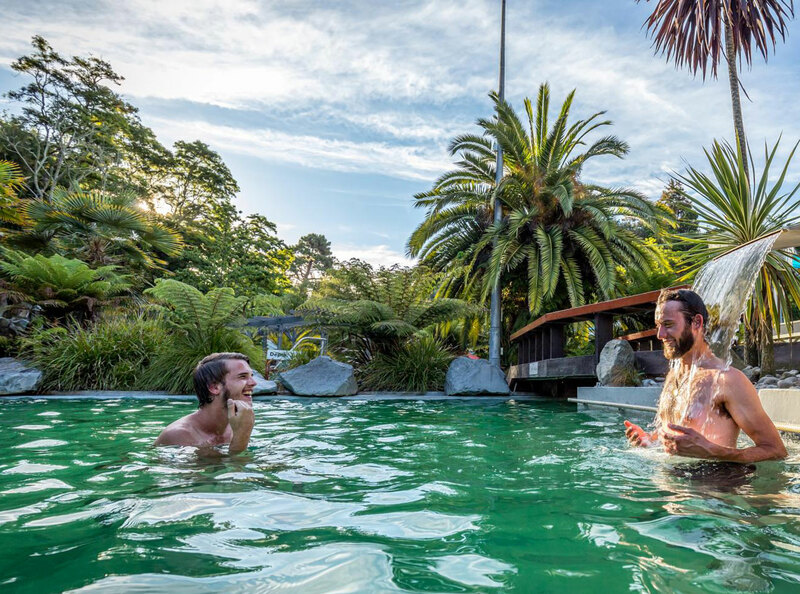 Nearby hot springs to the north and south fed by geothermal vents are quite popular, and a stay at Taupo DeBretts is a great way to unwind. The resort and spa has a water park complex that includes two mineral pools, indoor private pools, slides, and a water playground along with some freshwater pools and spas. There are a variety of choices for accommodations—including camping sites, RV hookups, cabins, motel rooms, and larger family villas that overlook the lake. Enjoy all the adventure opportunities around the lake, like bungee jumping or white-water rafting. 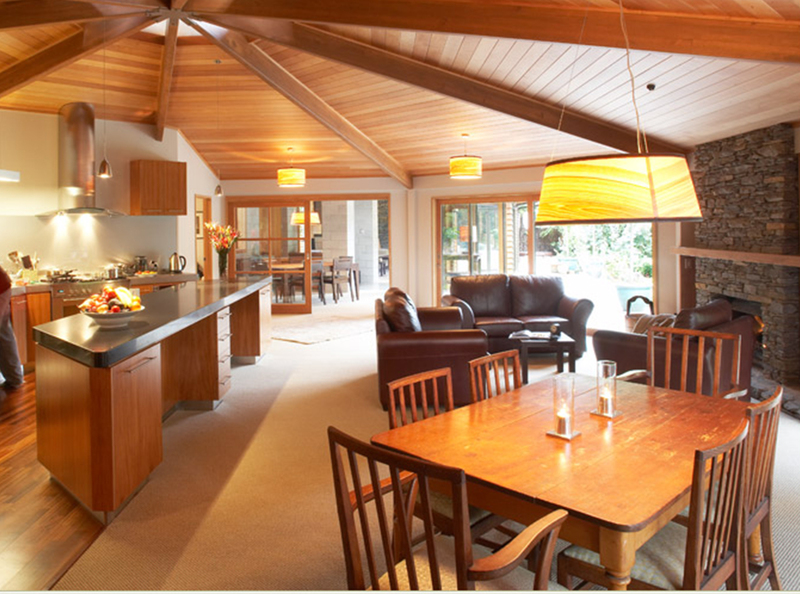 If you decide to head to the other side of the lake to Turangi for some fly-fishing on the famous tributaries that flow into Lake Taupo, be sure to book a room at River Birches. Opened up by an American expat photojournalist and his wife, this gorgeous garden spot features a main lodge with three guest rooms that open up to a central deck within the garden. A new Cottage option is also available with three rooms in a more self-contained setting ideal for families or groups of friends. While the Lodge won first place in a recent New Zealand architecture competition—for fly fisherman it’s all about location. It’s mere steps away from the famed Tongariro River, which fills with big rainbow and brown trout each spawning season. 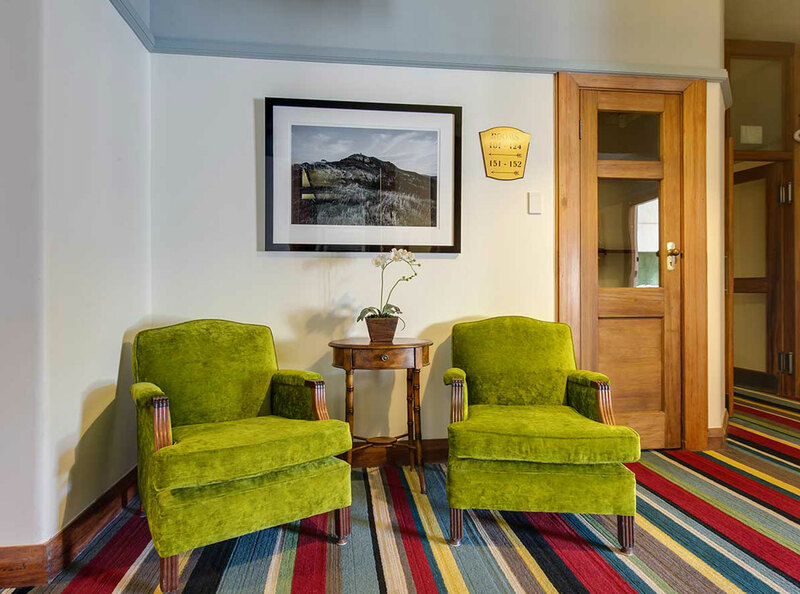 Book a table at the Tongariro Lodge for a cozy, fire-side meal. Celebrities, politicians, and fly-fishing luminaries have all come through and posted pictures of their best catches on the ‘wall of fame.’ Well-heeled fisherman can also book heli-fishing tours from here—the chopper can land on the lawn—which will take you high into the mountains far from any accessible spots on the river or other tributaries. It’s estimated that 50% of all of New Zealand’s birds—including owlet-nightjar, bush wren, huia, and New Zealand quail—have gone extinct since settlers came in the 1300s. The same goes for bats, frogs, freshwater fish, and geckos. New Zealanders recognize the value of their unique biodiversity, and the Department of Conservation has aggressively moved in the last few years to protect and preserve what’s left. They’ve started programs to eradicate the harmful rodents and plant endemic flora, getting rid of pests and non-native plants and trees. Check with Tourism New Zealand, for more information on eco-tourism opportunities. 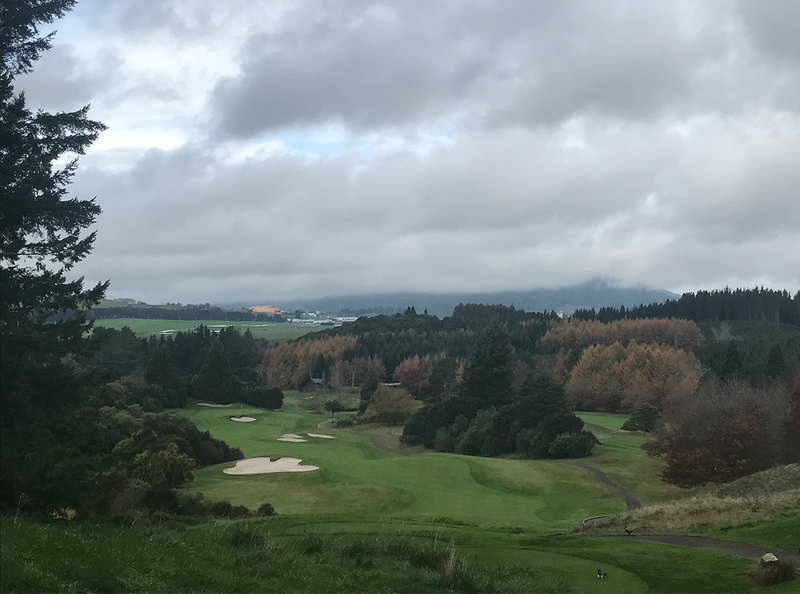 Two top spots near Lake Taupo include the Blue Duck Project on the Tongariro River and the Wairakei Golf & Sanctuary in Taupo, both of which are helping to bring New Zealand a little closer to natural equilibrium. 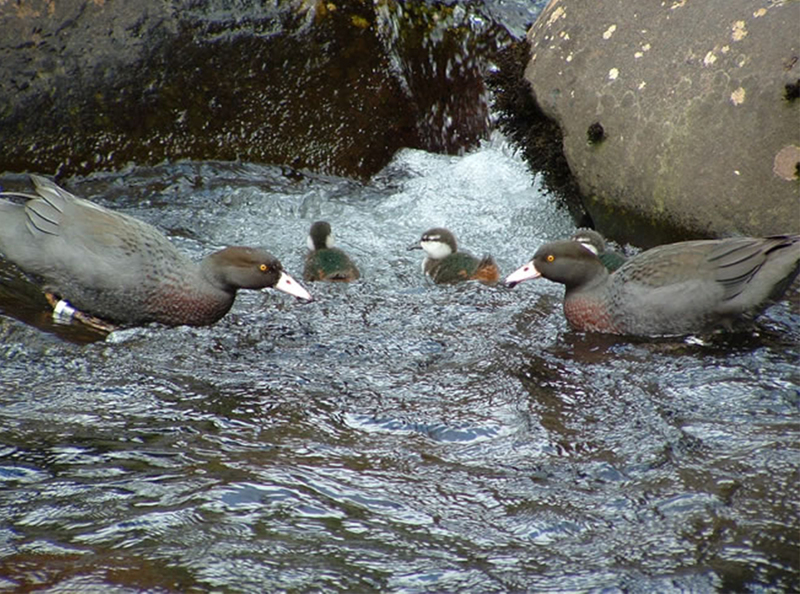 The blue duck, or whio, is a waterfowl that lives in the more remote locations in the backcountry—mostly concentrated around the waters that rush down out of the mountains in Tongariro National Park. For that reason, in 2008, the owner of Tongariro River Rafting, Garth Oakden, founded the Blue Duck Project. It’s a conservation adventure called the Tongariro Blue Duck Experience. You’ll paddle through the chilly waters of the Tongariro to check pest traps and spot blue ducks. Oakden’s been guiding since the 70s and is an expert at maneuvering the small raft mostly through class III rapids. A few miles down the river, you’ll beach your raft and head into the rain forest to search for a trap to reload. Brave a few more boiling rapids on your way back; there’s a whitewater section that’s prime for snapping an epic picture. There are plenty of animal sanctuaries around New Zealand, but only one on a world-class golf course: Wairakei Golf & Sanctuary. 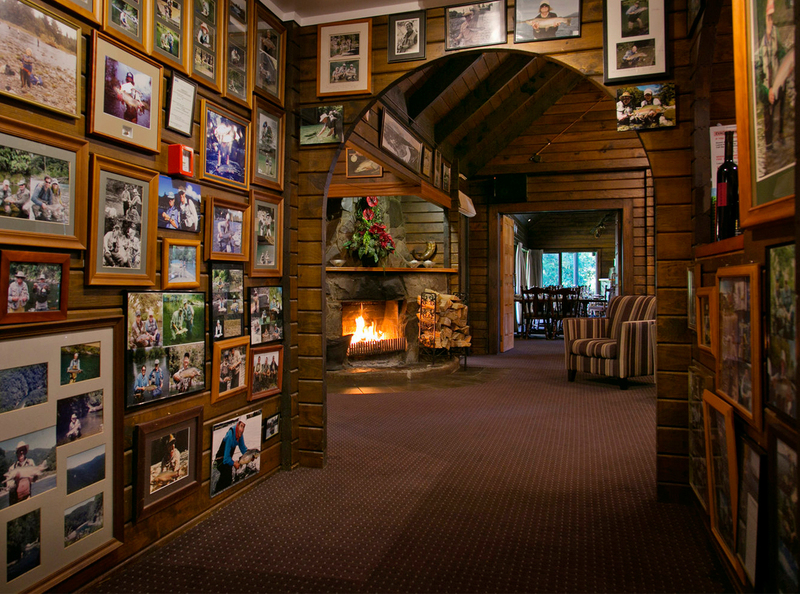 The sanctuary is close to the banks of the powerful Waikato River and is the creation of golf course owner and entrepreneur Gary Lane. He wanted do his part to support the vanishing New Zealand flora and fauna on his 445-acre course, so he erected a special pest-proof fence, called Xcluder, to encircle the land. It protects over 40 species of birds including endemic ones like the western brown kiwi, New Zealand falcon, scaup, takhane, New Zealand pigeon, tui, and whitehead. The sanctuary is also dedicated to making sure New Zealand flora is reintroduced to the area, with over 25,000 native trees already planted and another 5,000 exotic plants to help the bird life stay established. Future plans include adding more plants and birds along with lizards, insects, and other endangered species. Besides being a working trout hatchery that helps monitor and manage the rainbow and brown trout in the region, Tongariro National Trout Centre is also a repository of the history and knowledge of the first fly fisherman to move into the area. The museum inside has a huge library of fly-fishing books and manuals, and displays lots of antique rods and reels. There’s also an indoor aquarium that features some of the native species that have struggled to survive since the introduction of the more aggressive trout. There’s a big pond for kids to fish in where they can learn to cast a fly rod and land their first trout. There are numerous “fish-out” days a year and any child between the ages of 6 and 14 can try their hand at fly-fishing in the pond (book in advance). One other important aspect of the center is the whio (or blue duck) hardening facility, which uses water from the river flowing through faux river beds to help the endangered ducklings learn how to navigate and survive in swift water. For your first time fishing in New Zealand it can help to hook up with a local guide to get you on the right spots with the right flies. Most lodgings in the area will have services they use and can steer you to a competent and productive guide. One of the best local fly fisherman is Andrew Christmas, who runs a guide service for trout fishing and deer hunting out of Taupo. No experience is necessary for going on a guided fly-fishing trip with Christmas, and all equipment can be provided for novices. Already a veteran fly fisherman? He can lead you to the perfect spots and get you on a fish in no time. 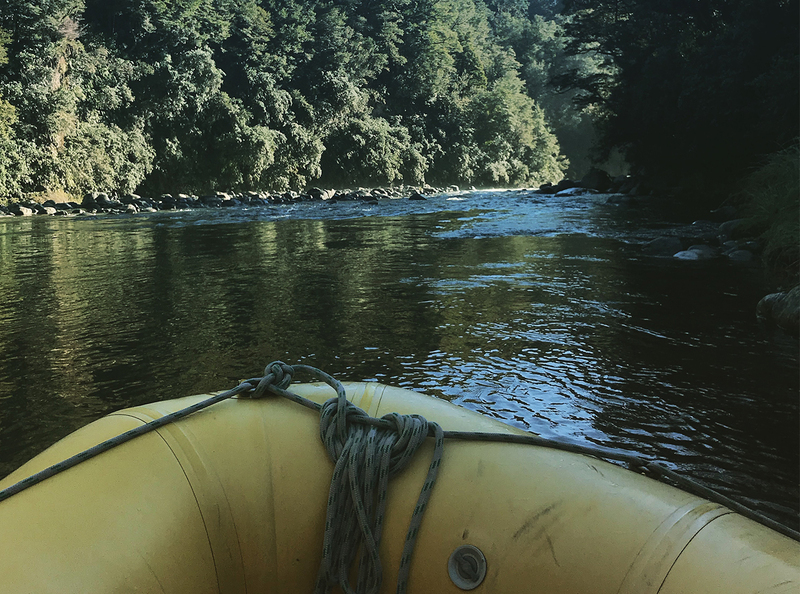 You can get a half or full day of guiding (or even a tailored trip made to suit you), and more luxurious packages feature a two-night stay at the Turangi Trout Lodge, or trips to fly-fish via white water rafts for greater chances to land some trophy-size trout!